I've only seen Scooter occasionally recently. He was at Franklin this morning though, on his own. I saw a small group of swans further north along the riverbank, and these were probably his siblings. Scooter's foot continues to deteriorate. He's probably best off without it now, although he seems to use it in some way for steering. 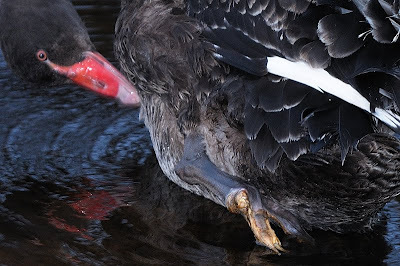 I note that his plumage has not developed as much as that of his siblings, and he is still relatively brown rather than black, and he retains a fluffiness that the others were pretty much over. All things considered, Scooter has done pretty well. How far have the family relocated? Curious to know what his ability to swim is like, as I assume he cannot paddle/run fast enough to launch into flight. Aren't there any wildlife carers who would be interested in helping Scooter? If his leg needs attention, haven't we got the equivalent of the RSPCA?